I have created a solid silver Saturn Pendant - complete with rings crusted with tiny Campo Del Cielo iron meteorite fragments. I have filled the craters on the surface with glass enamel. 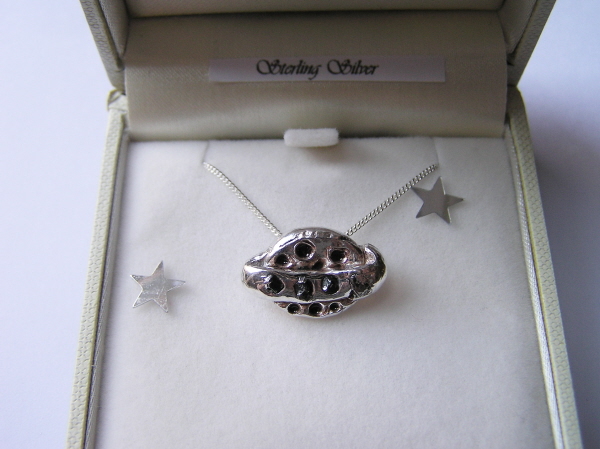 The pendant is strung from an 18 inch sterling silver curb chain and boxed in a padded, velvet lined box. You will also receive a signed certificate of authenticity and an exclusive free gift - an illustrated A4 meteorite information sheet. This was written for Jurassic Jewellery by Mark Ford - Secretary of the BIMS (British And Irish Meteorite Society) and gives a useful overview of meteorites.